The meaning of a message, says William Mitchell, depends on the context of its reception. "Shouting 'fire' in a crowded theater produces a dramatically different effect from barking the same word to a squad of soldiers with guns," he observes. In Placing Words, Mitchell looks at the ways in which urban spaces and places provide settings for communication and at how they conduct complex flows of information through the twenty-first century city. Cities participate in the production of meaning by providing places populated with objects for words to refer to. Inscriptions on these objects (labels, billboards, newspapers, graffiti) provide another layer of meaning. And today, the flow of digital information -- from one device to another in the urban scene -- creates a digital network that also exists in physical space. 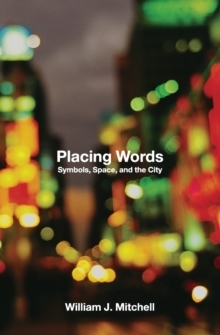 Placing Words examines this emerging system of spaces, flows, and practices in a series of short essays -- snapshots of the city in the twenty-first century. Mitchell questions the necessity of flashy downtown office towers in an age of corporate Web sites. He casts the shocked-and-awed Baghdad as a contemporary Guernica. He describes architectural makeovers throughout history, listing Le Corbusier's Fab Five Points of difference between new and old architecture, and he discusses the architecture of Manolo Blahniks. He pens an open letter to the Secretary of Defense recommending architectural features to include in torture chambers. He compares Baudelaire, the Parisian flaneur, to Spiderman, the Manhattan traceur. He describes the iPod-like galleries of the renovated MoMA and he recognizes the camera phone as the latest step in a process of image mobilization that began when artists stopped painting on walls and began making pictures on small pieces of wood, canvas, or paper. The endless flow of information, he makes clear, is not only more pervasive and efficient than ever, it is also generating new cultural complexities.